Holy Moly & The Crackers is a seven-piece ‘Gypsy Folk Rock’ band with founders Conrad Bird, Ruth Patterson and ‘Squeezebox’ Rosie leading the band with compelling charismatic style. Influenced by an electric range of folk and popular music, Holy Moly & The Crackers play a moonshine mix of rock, pop, folk, blues, balkan, klezmer, ska, reggae etc. The mighty Teesside a cappella merchants are a well-established and popular act at many folk festivals with a unique mob-handed presence that’s felt as well as heard! Each of the five Wilson brothers (Chris, Ken, Mike, Steve and Tom) is a fine and distinctive singer in his own right but what comes across above all is the sheer forthright ebullience, the joy of singing; of siblings together in close harmony, creating out of contrasted yet complementary individual voices something consciously controlled and arranged yet without a trace of preciousness; internally flexible and yet also immovable as granite. 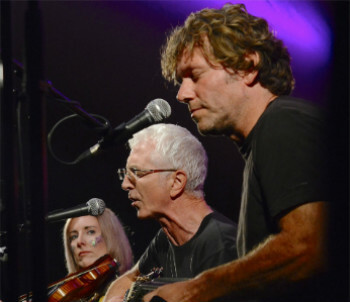 The Duncan McFarlane Acoustic Trio combine the full sound of Duncan’s own tremendous guitar playing together with the excellent, sympathetic yet punchy fiddle of Anne Brivonese and Steve Fairholme’s fine melodeon playing and vocal harmonies. A terrific band and a favourite at festivals everywhere. Jimmy Aldridge and Sid Goldsmith are a highly acclaimed folk duo who play traditional and original music of the British Isles. Over the last three years they have built a reputation on the UK folk scene for arresting and moving performances. The songs themselves are always given centre stage but they are brought to life with sensitive musical arrangements and stunning vocals. There is an integrity that shines through their performances and a common thread of political struggle, resistance, and justice. Chris Sherburn and Denny Bartley have been bringing their unique sound to audiences across Europe and America since the early 1990s, when a chance meeting at a music session created one of folk music’s most enduring partnerships. 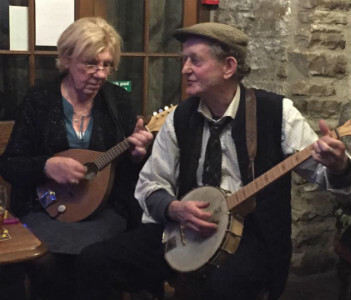 Known for their soul stirring songs, exhilarating tunes and a love of the craic, Chris (concertina) and Denny (guitar and vocals) ensure that no two concerts are ever the same. Leftfield folk and storytelling trio Harp and a Monkey specialise in poignant, humorous and melodic short stories about northern life, love and remembrance. Such is the outfit’s reputation as a quality live act, they have twice been invited to appear at the annual international showcase (The English Folk Expo) that highlights the best English folk acts on the circuit. 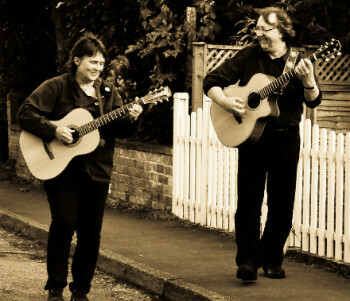 Fingerstyle guitar virtuoso Steve Hicks and singer songwriter Lynn Goulbourn met at a gig in 2007. With a mutual love of folk, roots and acoustic genres, their musical partnership has flourished and taken them to all corners of the UK, to Germany and the USA. They thrive on the creative process of stretching established boundaries and perform mesmeric arrangements of traditional, contemporary and self – penned songs and music. Expect the unexpected ……. A set by American songwriter Zoe Mulford is like a small volume of short stories – evocative, beautifully crafted, and endlessly varied. Whether her starting-point is a polar expedition in 1845 or a Greyhound bus ride in 2007, her vivid storytelling and down-to-earth humor take listeners on an enjoyable journey accompanied with guitar or claw-hammer banjo. 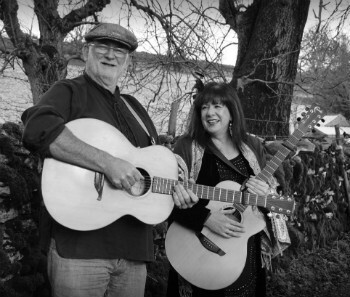 Mic and Susie Darling bring songs and stories based on their experiences as part of the Traveller community. 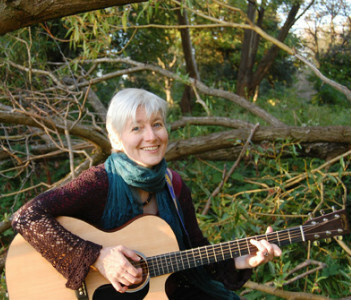 Michelle Holding sings traditional and contemporary British and American songs, playing guitar, banjo and concertina. Blessed with a striking and distinctive voice, she performs with passion and sensitivity. Confesses publicly to being a Morris dancer and also calls dances for ceilidhs, something which she is gaining quite a following for, through her welcoming, gender free calling style. Michelle is starting to wade into the murky waters of classic English fingerstyle banjo. Her accompanist Bonz is a talented multi-instrumentalist, playing dobro, banjo and harmonica, and provides harmony vocals when with Michelle. Michelle has a great new CD release. Click HERE to get yours now. Karin is a singer/songwriter with some 30 years experience in the Jazz/Blues field. Several years ago she became enthralled with Folk Music and its diversity and started to write and sing Folk Songs. Now teamed with Karl Robins (singer/songwriter/multi instrumentalist) she devotes her time solely to writing and performing within the Folk genre. Karl Robins has been playing for many years in the Acoustic Folk/ Folk Rock genre. A songwriter since his late teens, Karl likes to experiment with different rhythms and styles. He plays acoustic and electric guitars, Puerto Rican Cuatro and sings melodies and harmonies. Tan Yows are a female singing duo from Cumbria whose repertoire extends from medieval French drinking songs through a capella folk to more modern ballads. 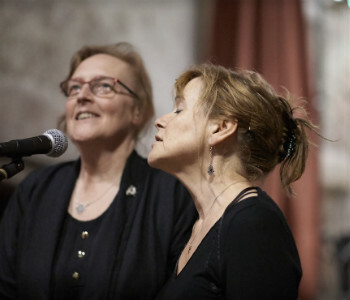 Jan Harrison and Lynda Howard started singing together about 8 years ago, having discovered that they had similar tastes in tunes and subject matter and voices which go well together. The name Tan Yows (Cumbrian for two ewes) derives from Lynda’s sheep-knitting business and has carried through to the titles of the two CDs: ‘Undipped’ and the shortly to be released ‘Hefted’. Tan Yows now have the benefit of accompanist Richard Selvidge on guitar and mandola which has helped to widen their repertoire. 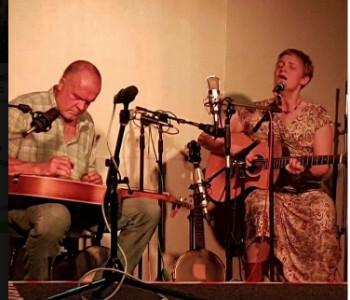 From the traditional to the unexpected, Westmorland Rising’s Sue Kennedy and Chris Mullen dip their toes into a variety of genres to bring an eclectic mix to the folk table. This duo may be a very recent collaboration, since April 2017, but their sound is beautifully balanced with Chris’ harmonies and sensitive guitar accompaniment blending perfectly with Sue’s enchanting vocals and delicate instrumentals. The Giggleswick Temperance Band, with caller Michelle Holding, will be playing for the Ceilidh on Friday night. The band members have all been involved in the music scene for many more years than they care to recall and the breadth of their experience is evident in the quality and variety of their music which ranges from the traditional through jazz standards to ragtime and everything in between. Morris Dance Sides will be performing in the square.